It’s been a bad week to be Milo Yiannopoulos, whose Wikipedia page is about to include the word “former” in front of just about every personal achievement. Yiannopoulos—wrongly and repeatedly cited as some sort of “provocateur” by publications unwilling to call him what he is: a disingenuous parasite who promotes hate for his own mercenary ambitions—was on track to massively boost his profile with the mainstream this week after being invited to give a keynote speech at this year’s Conservative Political Action Conference. But it all came crashing down, starting yesterday when CPAC disinvited Yiannopoulos. Then Simon & Schuster cancelled his upcoming book Dangerous, despite no shortage of outcry when the deal was first made public. And just before a personal press conference today, it was announced that he’d be departing from Breitbart, the far right media organization formerly run by White House Chief Strategist Steve Bannon where Yiannopoulos rose to prominence on the coattails of the GamerGate movement. All of this was the result of a year-old video from The Drunken Peasants podcast that resurfaced this weekend wherein Milo appeared to defend pedophilia within the gay community. When journalists gathered before him on Tuesday, Yiannopoulos used their time to attack the media, touch on issues of censorship, and harp on the perceived evils of “social justice warriors.” In his defense, Milo pointed to an alleged double standard: the “jokes” he made in the video were no different than those heard in any “drag bar”—a ridiculous distraction from his own diminished career prospects. A podcast with more than 100,000 subscribers is not a bar, nor does anyone hold a stranger in a bar to the same standards as a public figure speaking publicly. Anyone following Milo’s improbable career might be wondering what changed to make his brand of brazen awfulness suddenly toxic. As“a warrior for free speech” he reveled in being banned from Twitter after inciting harassment towards SNL’s Leslie Jones. He’s called women’s liberation “probably a mistake.” He’s referred to terrorist attacks “an expression of mainstream Muslim values.” In the grand scheme of the career of Milo Yiannopoulos, a defense of pedophilia—something he vehemently denies making—is not at all unusual. Part of the difference this time is that the attacks are coming from the right. It’s strange to think Yiannopoulos’s hate-filled remarks on other subjects were acceptable enough to be associated with Simon & Schuster, CPAC, and Breitbart, but flippant comments about pedophilia were over the line. In the end, those who raised Yiannopoulos’s profile were the same ones to bury it, showing that even those who benefit from Milo’s crusade of offense have limits on what they’re willing to cozy up to. But the crown jewel of the press conference was Milo’s announcement that without a website to publish him or a political party which dares to be seen with him, he would begin a “new media venture,” built on his own miniature cult of personality. Yiannopoulos’ last media venture, The Kernel, was sold after a protracted legal battle over unpaid wages to contributors, and much of the writing under Milo’s byline at Breitbart was revealed to be written by a team of interns. He also noted that “the book will come out as planned,” though he failed to mention which publisher—if any—had expressed interest. 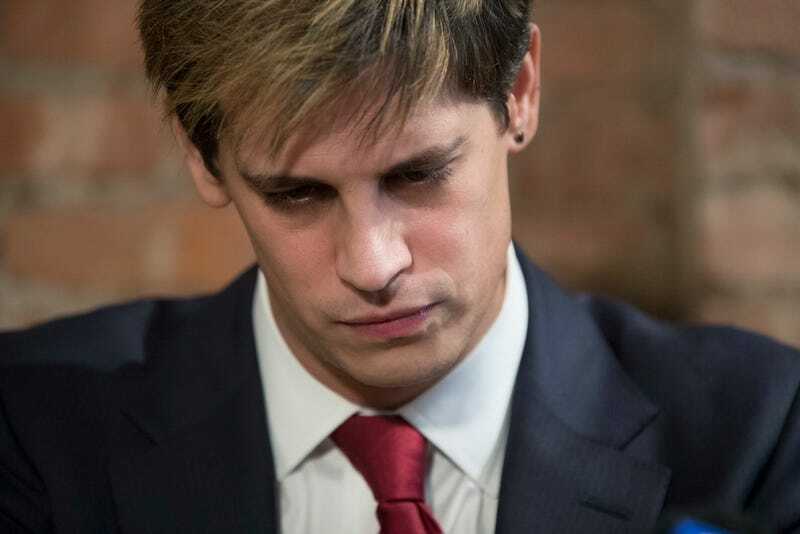 Try as he might to frame everything he’s lost in the past two days as the start of a new beginning, Milo’s star is fading, and it has left those close to him divided. Twice during the press conference, Milo said, “I haven’t ever apologized before and I don’t anticipate doing it again.” The attempts to sound defiant were undermined by how clearly rehearsed they were. We have reached out to Yiannopoulos for comment and will update if we hear back.